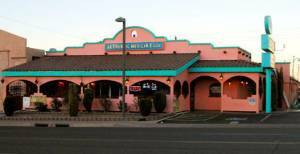 If you’re in Page and you’re searching for the enjoyable food, hospitality, and traditions of Mexico, look no further than Fiesta Mexicana! This family restaurant has been in Page for the last 13 years! Owners Martin and Patricia Rangel, and General Manager Miguel want to make sure you leave satisfied. 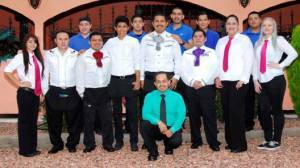 As soon as you step inside Fiesta Mexicana, you experience the professional and courteous staff. Your senses will be transported to Mexico as you see the colorful décor, hear the lively cultural music, and smell the mouth-watering authentic Mexican food. 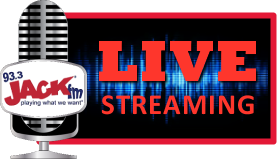 Martin and Patricia Rangel moved to the United States from Jalisco, Mexico, the most representative state of that country in early 80’s. Since their youth they used to enjoy authentic Mexican food in their native Mexico. However, after moving to United States they missed the delicious authentic Mexican food. After owning and working several years in a Car Body Shop, part time in a restaurant and running a Latin Market, they decided to start their own Mexican Restaurant and share the authentic flavors of Mexico. Fiesta Mexicana pledges to be a place where you can enjoy an exquisite dish and a refreshing margarita. With reservations for special events like birthdays and graduations, tour bus accommodations, a full bar with AMAZING specialty drinks, and daily lunch specials at only $6.99, Fiesta Mexicana is the perfect place to go whenever you’re in the mood for great food and fantastic service. 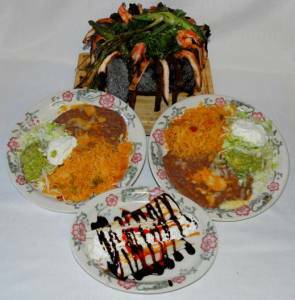 No matter what you’re in the mood for, Fiesta Mexicana has something delicious just for you! If you want a little bit of everything, try the Combo Appetizer: Nachos, quesadilla, chicken taquitos, served with guacamole, green onion and sour cream. Want something with eggs? You have to try the delicious Machaca; Slices of skirt steak mixed with delightful scrambled eggs. Stopping by for lunch? Their specials are to die for! The Arroz Con Camarones are fantastic! Prawns, sautéed with mushrooms in a special sauce? Yum! From burritos to enchiladas to tostadas to kid options, you are never going to run out of delicious new things to try! And the platters? WOW. Tampiquena Chicken — juicy chicken breast stuffed with shrimp, wrapped with bacon, and topped with creamy mushroom sauce…is your mouth watering yet? Finally, the house specialty; the Molcajete…are you ready for this? Grilled skirt steak, grilled chicken, shrimp, pork chops, chorizo, mozzarella, grilled cactus, special red tomato sauce, served in a half volcano bowl with two side plates and rice and beans. I’m already full just thinking about it! When generous portions, attentive staff, and absolutely fantastic food are your main priorities, get over to Fiesta Mexicana — you’ll be glad you did!